When you buy external desktop hard drives, you make several assumptions. 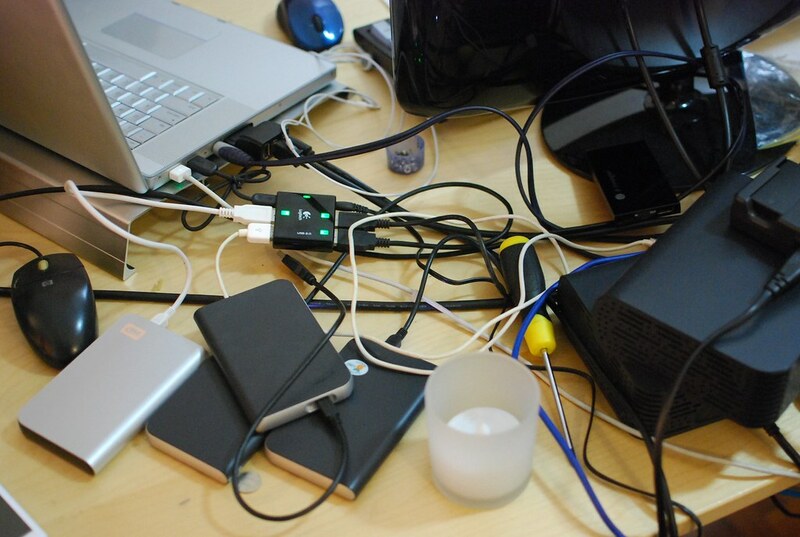 For one, you'll need more power boards, cables and desk space than you think. They multiply, and when they do, you'll wish you had a NAS or a proper tower for them. You may even persist on showing the same photo from 2009 because it illustrates your point so well. Secondly, unless they specifically mention otherwise, the manufacturer's premier drives aren't going to be appearing in them. They won't be the fastest, most reliable, have the highest amount of cache, or come with the most unicorn dust. With the exception of the latter, these won't entirely be an issue given your biggest bottleneck will probably be the interconnect, and not the speed of the drive (at least, for now). And finally, if you purchased your drive a few years ago, chances are you'll never know what the internal connection is short of ripping them apart yourself. Unfortunately, most drive manufacturers don't list whether a drive was built to accommodate IDE, SATA, SATAII, etc. This is perhaps to be expected; these drives were not designed to be user serviceable. There is one way out; other people online may have posted images or a video on disassembling a unit the same as yours. For some frustrating reason though, many of these videos and photos are careful never to show the side of the drive with the interface, nor the ATA ribbon or narrow SATA cables. On my more cynical days, I feel as though everyone does this on purpose just to torment us! I belabour all this given I've spent the better part of two hours searching online for any detail at all on several older, perfectly good enclosures I have. Clara is running out of space, and I'm chomping at the bit to swap out their internal drives with others that I've replaced from my Mac Pro. Enclosures are notoriously difficult to open, and I'd hate to get all the way there and realise the connectors aren't compatible. Along with the mystical opening hours that restaurants never put on their websites, I wish I could somehow find a resource that had model numbers and specific technical details for drive enclosures, beyond the general specifications given to consumers like "USB 3.0" or "Designed for Windows XP". But trust me, on the sunscreen.